I am a bit busy with other things, so sorry for keeping this brief. 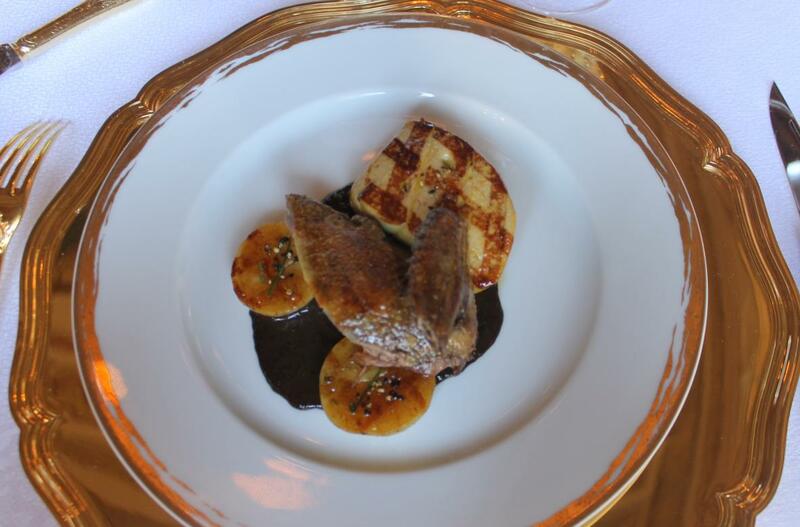 In a nutshell: I went back to two old personal favourites that I have not visited for many years, 3 star Michelin L’Arpège in Paris ( reviewed here) as well as 3 Star Michelin Le Louis XV in Monte Carlo (current review). I was with my wife, so the report will benefit from the better pictures (than those of my humble pocket camera) of her more sophisticated camera as well as her additional views. Please find below the usual ‘Pros’, ‘Cons’, Overall ‘food’ and ‘service’ scores. A month after my meals, I always add a ‘What I think a month later’ section that you’ll see completely at the bottom of each of my reviews, so that you’ll get a feel of how my perception of my meal has evolved in time. 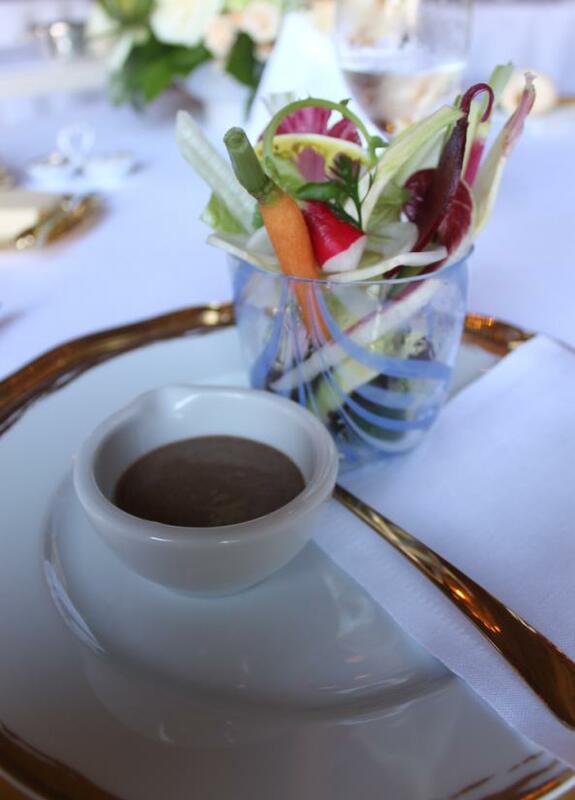 The meal started with their long time offering of crudités (carrots, celery, radish, etc), typical of the region as it could remind a bit of nearby Nice’s raw vegetables served with an accompaniment of sauce (Nice’s bagna caùda). 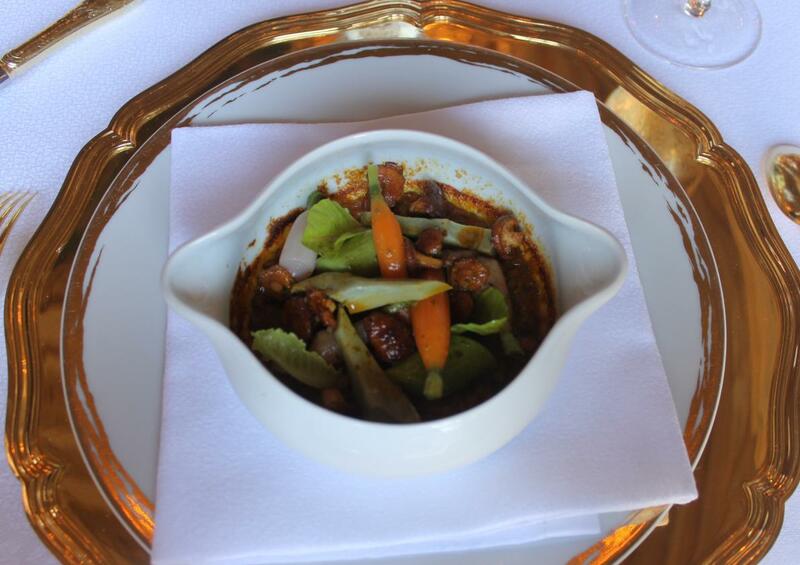 A fun idea, I have to give that to them, since it showcases the vegetables of the region, but this kind of serving really shines if the vegetables are going beyond the ordinary: those were as good as any celery or carrot or radish I was sampling all along my stay on the French Riviera. But the dip (made of olives and egg, emulsified with oil like a mayonnaise) was a benchmark of its kind, with glamourous texture and a depth of taste as rich and as exciting in mouth as it gets. I do not know if that was wowness..I just know that you won’t easily find dips of this level. It’s for creations of this kind that I go to restaurants. They are known for their lovely bread offerings, of which I picked a pain baguette (Yep, I am a huge fan of Pains Baguettes, and do expect them to be at their best on the grand tables of France and this one was no exception as they have baked an excellent one by the finest artisan Boulanger standards that I am used to, in France 9/10), and tomato bread (7/10 too salty to be enjoyable and the tomato flavor was not as stunning I would have liked). 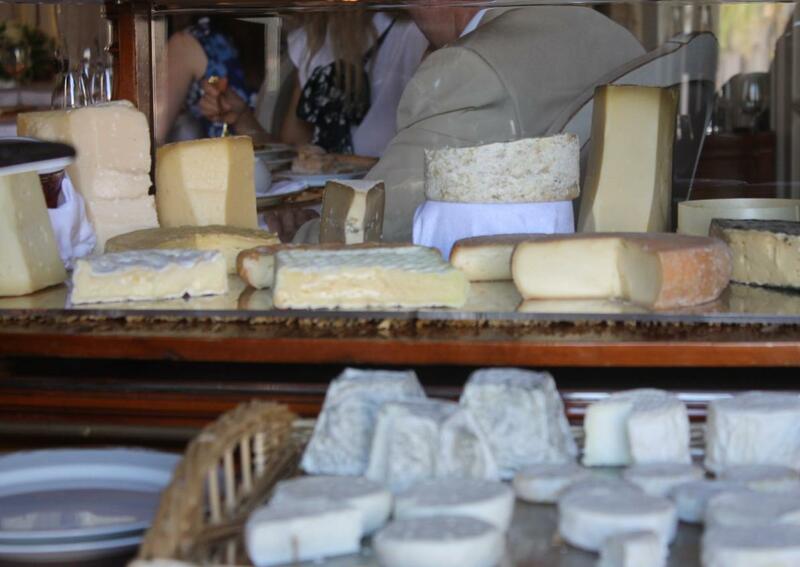 Then the generous cart of top quality cheese – France’s finest tables have that big pressure of having to offer cheeses of world class standard, and Louis XV’s cheese cart is an examplary one. All cheeses sampled showcased respective textures, tastes and body that were in their prime state. France’s highly regarded cheese-maturer Bernard Antony had his widely praised aged comté available and it is admirable to see how the folks at le Louis XV did justice to his famous cheese with remarkable storage technique and care, all features that sound simple in theory but that seem to fail in the hands of even very ambitious tables. The piece of comté, I was sampling, evolving onto expected toasty hazelnut aromas, subtle grassy and toffee notes progressively complementing the rich and complex intensity of the flavours. This was, in regard to what is expected at its age (3 yrs) , a superb sample of the comté. We’ve also enjoyed some superb Fourme d’ ambert, Camembert Jort lait cru as well as some nearby goat cheeses (which names I forgot since this was my first time trying them), all cheeses of benchmark mention. Many years after being blown away by their classic desserts of Baba au Rhum and Le Louis XV au croustillant de pralin , I did not bother perusing the dessert menu and ordered the two items. 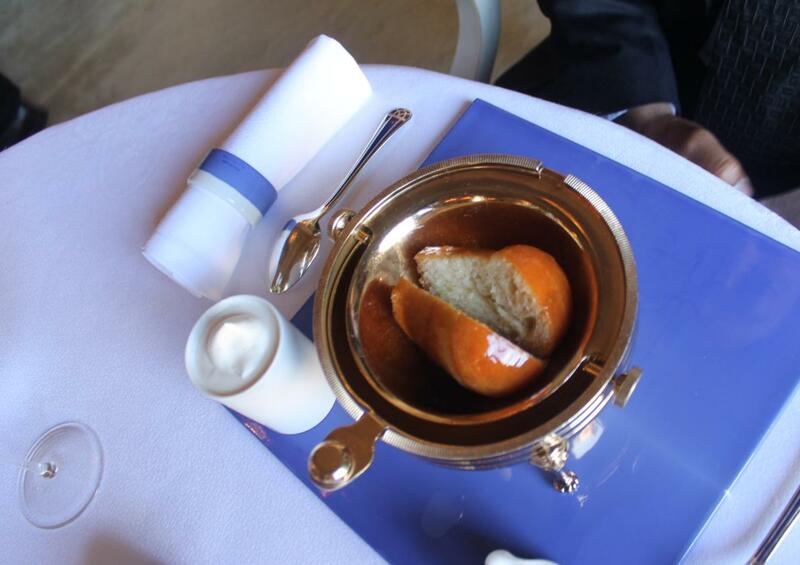 My wife (her first time at le Louis XV) does not like Baba au Rhum and she went with a soufflé of apricot. 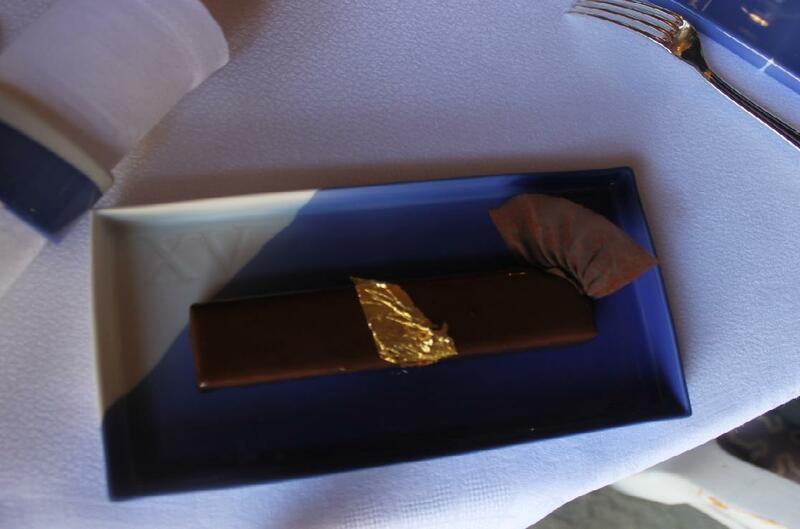 Louis XV au croustillant de pralin– A hazelnut biscuit wrapped in a ganache of dark chocolate. Alain Ducasse’s famous refined take (sort of ) on a chocolate crispy brunch bar. The ganache having smooth glamourous texture showcasing great precision from the pastry team, and the hazelnut mousse airy texture as enticing as I remember it from last time (they do not have the same Pastry Chef as on my last visit, here). An 8/10 this time. Soufflé d’Abricot – Properly risen soufflé, but the sourness should have been better controlled (that was way too strong for the soufflé to be enjoyable ). 7/10 as/per my wife, a score that I share ….. but come to think about it, I’d not be surprised to learn that that bold sourness is perhaps appreciated by many people. We both are just not fans of big sour flavor in soufflés. Chocolate, petits fours – This is to be taken with a grain of salt since there’s definitely no matter of serious displeasure here, but I found the chocolate offering, although of good quality as you might expect from such place, to still not reach the heights it could have in the hands of an exceptional artisan chocolatier, to take an example. I gather this is real nitpicking, that it is a restaurant, not a chocolatier, and it would be stupid to put down the overall appreciation of my meal on the pretext of such observation, but there are couple of 3 star Michelin destinations – even in the US for example, let alone throughout Europe – that are offering a better variety of chocolate closer to what I am referring to. 7/10 for the chocolate (in view of what I am expecting at this level of dining), but in total fairness, there’s really few 3 stars offering the type of outstanding chocolate of the level of an exceptional artisan chocolatier. The mignardises left me with almost similar impression: good execution and tasting fine of course, but not of the level of, say, the outstanding petits fours I once had at Pacaud’s L’Ambroisie (where concentration of flavor, stunning taste and glamourous definition of textures rivaled each other). 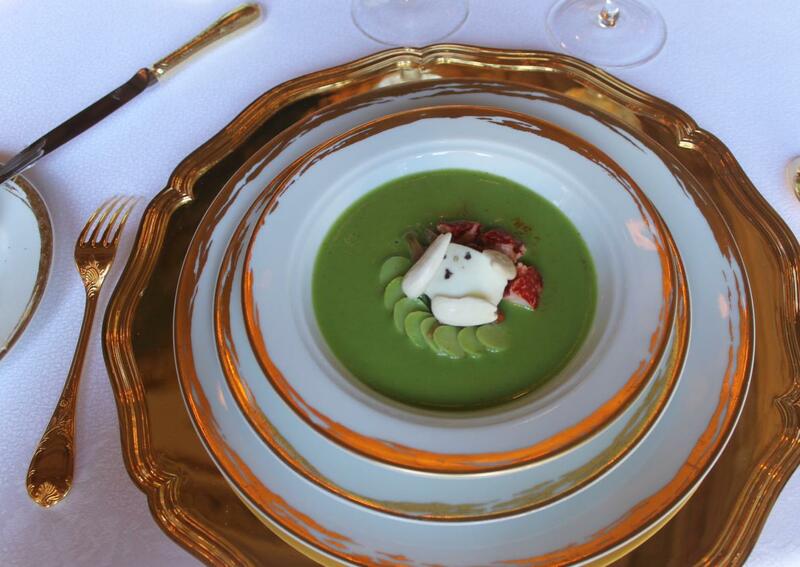 It is all in the details, I know, and that is why top dining destinations like Le Louis XV do exist: for the opportunity to go deep into the details of a stellar dining experience. 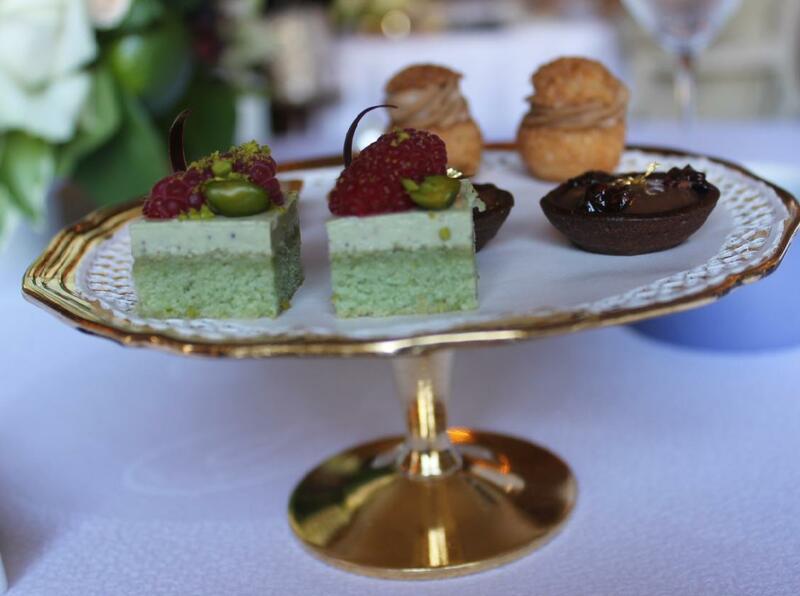 8/10 for the petits fours (again, in comparison to what I am used to at this standard of dining). PROS : One of world’s most richly decorated dining rooms, sublime service, the lovely experience of being there. The Baba. The benchmark cheeses. CONS : I miss a more personal and authoritative cooking imprint like I have sometimes enjoyed from Chefs like Bernard Pacaud, Maximin or Roellinger, and at numerous humble eateries all along the Mediterranean coast, or even here, years ago, under Cerutti. Overall food performance: 7/10 Good and properly executed cuisine for this genre (Classic French/Med), the Ducasse philosophy applied as far as keeping the fares simple and respectful of the ingredients, but this is my favourite type of cooking, so I know well what I need to expect from it, which is deeper expression of the flavors (exactly as many restaurants manage to do with classic cooking of this sort on the Italian riviera or as Chef Cerrutti actually did when I was here many years ago) and that is where I was a bit less impressed. And No, it’s not a case where ‘’my palate may have evolved since that time, so perhaps my expectations are not realistic anymore’’’ (such theory would make no sense: I have just re-visited L’Arpège after almost the same amount of years of no-show and was still blown away by the fabulous taste of some of their creations). All in all, my general impression of the savouries matches an overall score of 6/10, which is good enough, though not great, but I found that the pastry team did quite a remarkable job (I was very impressed with the Baba au rhum being as stellar as over a decade ago, perfected and so delicious, and despite the way-too-sour soufflé and my severe observations on the mignardises, this pastry team has the solid and reliable skills expected at this level) to deserve an extra point for their performance, which justifies the overall food performance score of 7/10. That said, it’s hard to reach a wide conscensus with what I am looking for in this type of cuisine, so I can understand why the focus is on flavors that can be acceptable to the most. Service: 10/10 They know with whom they can be a bit more formal or casual, while always offering the highest standards of hospitality and being professional. They litterally read in your mind, Lol. A great example of this is when my wife (really not a fan of this kind of grand luxury setting) revealed to me that upon entering the restaurant she was afraid to feel out of place, but that the behaviour of the staff gave the impression that she was at home, only the decor was far more elegant and she was pampered like a queen, Lol. Everything, in the end, looked normal to her, which says a lot about the genuine effort of this team to adapt to its guests in a customized manner. I am sure if I’d gracefully ask them to stop holding the chair for me when I return to my table (I come from an intellectual background that prohibits admiration for that sort of royal treatment…but of course, I was there dining, having fun, so I was not going to stop them from doing what they are supposed to do ), they’d oblige. Such is the impression I got: the customer first and foremost as they seem to be genuinely opened to whatever may satisfy. 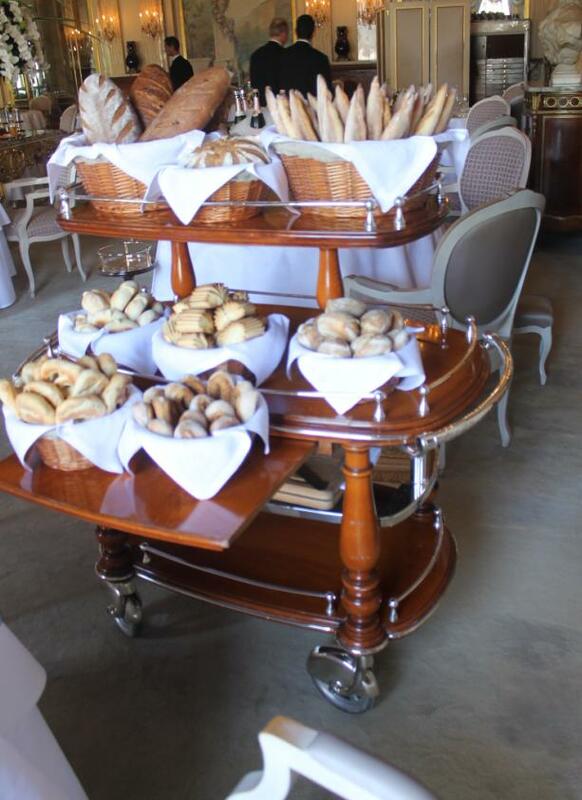 Décor: Belle époque grandeur, Christofle gold flatware, marble, chandeliers, trolley of bread, trolley of cheese, trolley of herbal teas. I love old world interior designs and architectures, so seating there and admiring this opulent décor was naturally a feast for my eyes. C onclusion: I may not have been floored by the overall food performance on this specific lunch (remember, nothing was wrong with the food, it is just that I tend to be partial to strong /bold/eventful flavors like those found in the dip of the crudités or while enjoying my baba au rhum ) , but Le Louis XV is a dining experience of superlative attributes (stunning decor, world class service, cheeses of the highest standards , choices of wines that will please the most demanding wine lovers and I can go on and on with the qualities). 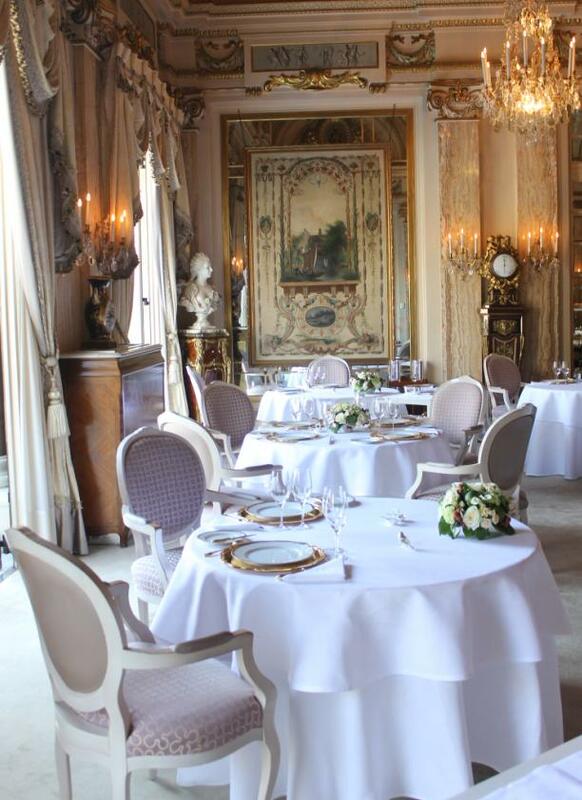 Added in Oct 2013 – What I think a month later: Hard to not like le Louis XV, it’s packed with so much charms, so many qualities and it’s an incredibly beautiful restaurant. And yes, the experience of being there remains second to none! And hey, it’s the Mediterranean coast, the sun, the amazing views. It’s also one of the rare places in the world where you can feel the genuine interest of the staff to always improve and please their guests, and they take criticisms really well. They take nothing for granted, which is an extraordinary feature and one that can’t be said of plenty of restaurants around the globe. Now this: when that velouté arrived at our table, my wife had this to say ‘ah, a velouté, you can’t go wrong with that, this dish will be very flavorful, there is no doubt about this”, to which I added ‘we can’t go wrong with the rest of this meal neither…look, some sheep’s curd, vegetable cookpot…obvious signs of deep joyous flavors…’, then we started eating and were both really surprised that the flavors were this discrete. Both my wife and I are not the kind of persons who will look down on what the most do take for granted, so we both do believe that greatness can be achieved with even the simplest food items, we both are opened to the idea that a simple velouté can be stellar even if it’s tough to make a bad one, therefore this is not a case where the diner attended a meal with the wrong expectations. To the contrary, we are sold to / and are very familiar with classic cooking of this sort and we are not the kind to attend a classical meal with visions of modern cooking in mind. It’s not even as if we could not figure out perfect scores for this type of classic cooking neither: I have just (couple of days prior to this meal at le Louis XV) rated plenty of classic French bistrot dishes with 10/10 scores, such as the lobster bisque at Bistrot D’Antoine (Nice), the Riz au lait at Le Casse Noix (Paris), let alone the instances when I’ve never hesitated to score a simple crème brulée with a 10/10 (if it ranks among the finest I ever had, why not? Being simple and classic does not mean that a dish is condemned to be average!). 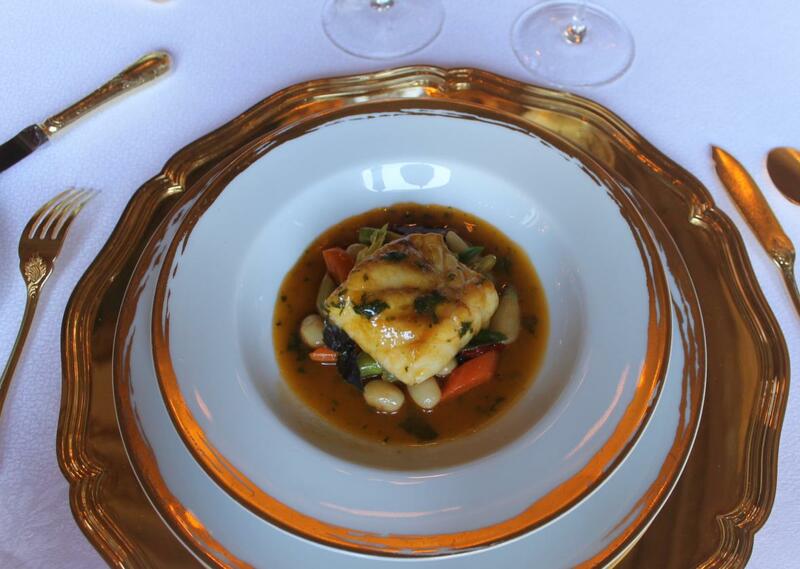 What’s more classic French than those dishes?? And I am French, grew up and spent half of my life in France, so lobster bisque, riz au lait, crème caramel have been for me what a hamburger is to an American. It’s not even the fact that I can’t figure a way to assign a perfect score to classic dishes or meals at the highest levels of Michelin star standards since I had many meals from Chefs like Jacques Maximin, Olivier Roellinger, Christian Constant, Gerard Besson that I scored with a 10. Most, if not all of them, not behind the stoves anymore but within the past recent two years, I still have not lost my ability to keep scoring highly anything that stands out and that is classic haute French or Italian (since the cooking at Le Louis XV is inspired by both type of cuisines): a score of 10/10 for a classic meal at Pacaud’s L’Ambroisie, some few 10/10 dishes at Il Luogo di Aimo e Nadia in Milan (classic), a classic Ravioli di Faraona – Guinea fowl ravioli at Dal Pescatore in Canneto sull’Oglio, and actually, right here at le Louis XV, a classic dessert like the Baba au rhum. I took the time to write all of that as a reminder that this is an instance where the kitchen was booting with an advantage: they had the diners on their side. 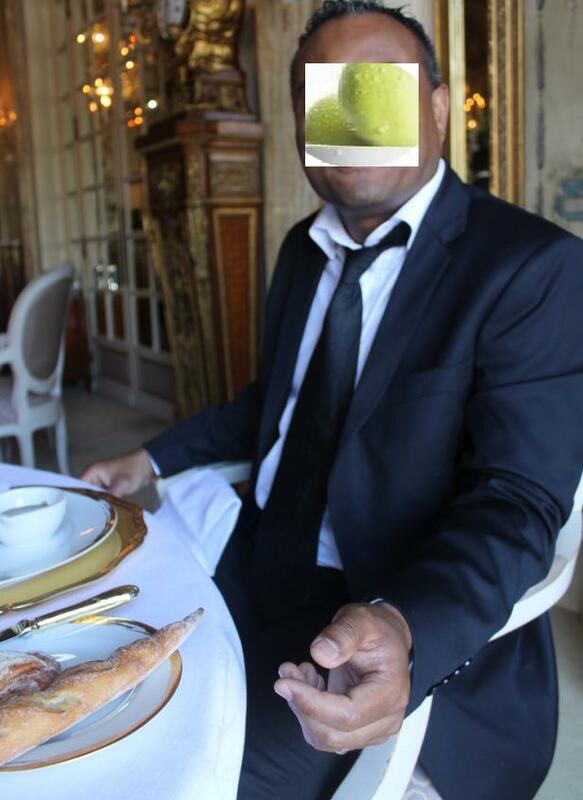 Later on, someone who knows Le Louis XV told me that he is certain that the less expensive menus would have fared better. Perhaps, since it is true that sometimes you have kitchen brigades that seem stronger on some of their menus, but again, sheep’s curd, cookpot cooking, those are known notions of flavor enhancement. So impart more zing in those savouries (like when Frank Cerutti was in that kitchen; nowadays he is still around in his role of supervising Alain Ducasse’s restaurants in Monaco, while Dominique Lory is the current Chef at le Louis XV) and I’ll be a happy camper, because on the food department, there are highlights that few restaurants around the globe do this well (for eg, that Baba au rhum. If you ever think that it is not rocket science to find a Baba done this well, then think twice! 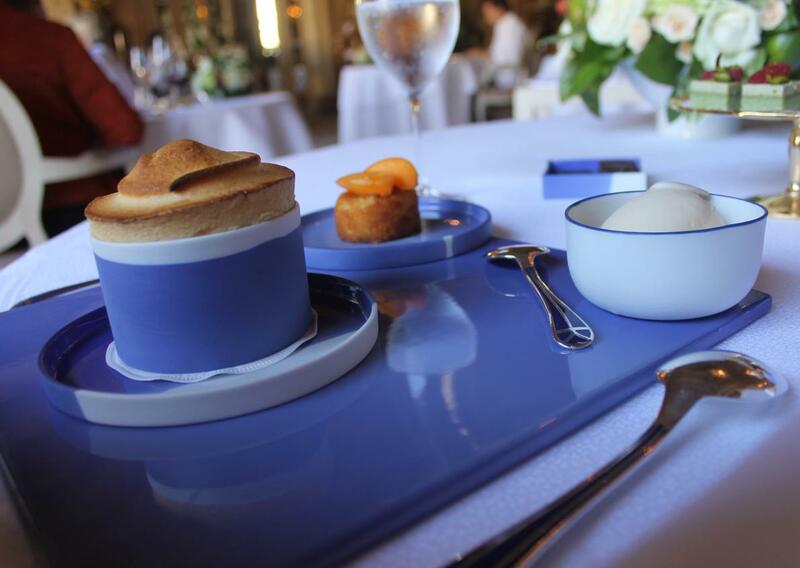 — For many ppl, the best of the Classic desserts of Alain Ducasse is the croustillant de pralin. To me, it’s the Baba).